De MedicNRG Rider apexlocator S3 is te gebruiken als een ,,standalone" digitale apexlocator of te koppelen aan aan endomotor* of een endohoekstuk* voor een ,, realtime" digitale meting. * Optioneel uit te breiden met een koppeling (Aansluiting Universeel of E-type) voor een Endomotor of een Endohoekstuk. 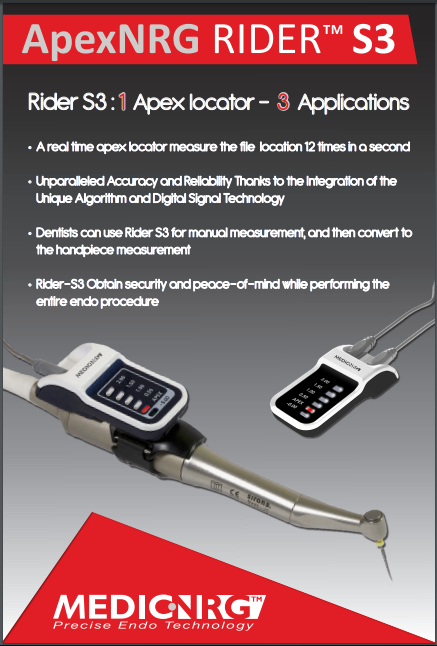 The new Rider S3 apex locator makes root canal treatment easier, safer, and faster. It is the world’s only apex locator that can be mounted on the dentist’s existing rotary handpiece / Endomotor to continuously give the position of the file in real time while pinpointing the precise location of the apical constriction. This unique feature eliminates the need to frequently stop and check the file’s position. This device can also stand alone like a conventional apex locator. The Rider’s patented Digital Signal Processing (DSP) provides consistent, reliable measurements with 0.1-mm precision, which reduces the risk of perforation. This unique DSP circuitry eliminates the erratic false readings associated with all analog devices. Other features include (1) accurate measurements not affected by the presence of blood, electrolytes, saline, hydrogen peroxide, EDTA, or sodium hypochlorite and (2) automatic calibration, among others. For the first time, the most innovative apex locator technology enables you to control the rotary shaping and cleaning process in real-time. 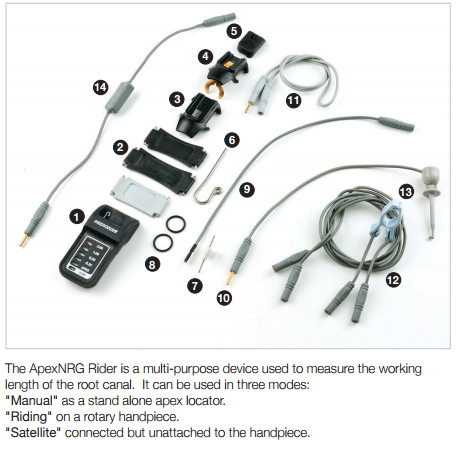 The Rider is the only apex locator in the world that can be mounted on your own handpiece to give the position of the file while it is proceeding down the canal and pinpoint the precise location of the apical constriction. This unique feature provides safety and time savings by eliminating the need to frequently stop and check the file’s position. Of course, the Rider can also be used “stand-alone” like conventional apex locators. Digital vs. Analog Technology: The Rider features patented digital circuitry for consistent, reliable measurements. Its unique Digital Signal Processing (DSP) circuitry eliminates the inaccuracies and erratic readings associated with analog apex locators. DSP is based on proprietary firmware which decodes the signals returning from the root canal as a result of the electric stimulus sent towards the apical constriction. The Rider’s proprietary algorithm continuously translates this data received via micro-electrical signals, refreshing the display constantly so that even 0.1mm movement of the file is read in real-time. Reliable Measurements in All Canal Conditions: The Rider’s accuracy improves the outcome of root canal treatment and is not affected by the presence or absence of blood, other discharges, electrolytes, saline, tap water, hydrogen peroxide, EDTA, saline, or sodium hypochlorite. Precision: The Rider’s superior measuring tolerance of 0.1 mm offers greater reliability in pinpointing the working length compared with the use of analog devices that only provide a measuring tolerance of 0.3 to 0.5 mm or the reliance solely on x-rays. 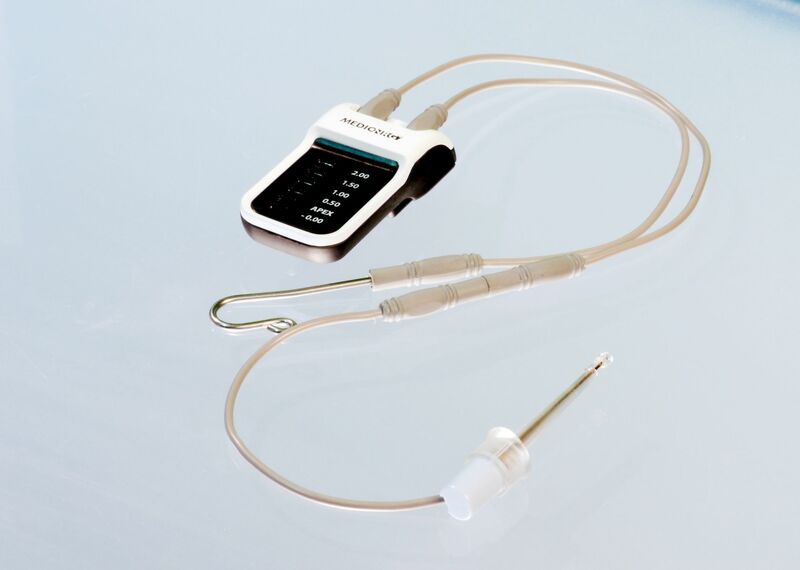 In Satellite position connected to any rotary handpiece or endomotor. Unsurpassed Measurement Stability: The Rider eliminates the “now it works – now it doesn’t” scenario associated with analog devices. Its patented DSP technology greatly reduces erratic readings and eliminates the frustration of sporadic false measurements. Avoid Perforations: The Rider can be helpful in identifying a perforation, large lateral canals, and root fractures. INTUITIVE EASE-OF-USE The Rider S3 apex locator features highly sophisticated technology and is so easy to use that there is not even an ON-button to push. The device is automatically activated and features automatic shut-off. Automatic Calibration: Ensures accuracy and eliminates the effect of changes in moisture within the canal during treatment. No Zero-Setting: The Rider does not require tuning to adjust to the condition of individual canals. Audio Feedback: Progressive sound control allows you to keep your eyes on the tooth and focus on the treatment. Color Light Indicators (LED): The Green LEDs provide a progressive display of the files position. The Red LED illuminates when the file is moved past the apical constriction (“Apex”). Compact Size & Durable, Shock-resistant Design (37 x 76 x 17mm): The Rider is a lightweight, conveniently portable device (26 grams) which allows placement within line of vision or on top of your own endo handpiece to monitor the file’s progress during rotary instrumentation. Fully Autoclavable Accessories including the set of cables, lip hook, file holder, apron clasps, and optional touch probe.